The Dri Eaz LGR2800i dehumidifier is a an advanced, even ground-breaking dehumidifier for restoration, industrial and commercial applications. It uses Low Grain Refrigerant technology to remove more moisture from the air than a conventional refrigerant dehumidifier, "intelligent" monitoring and control systems and an optional facility for remote monitoring of the unit, for more effective project management and improved cost-control. 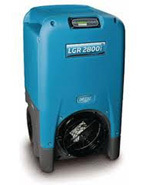 The Dri Eaz LGR 2800i dehumidifier is an outstanding unit for applications including water damage restoration, structural drying, construction and a host of others where the temporary provision of industrial strength moisture removal is required. It is a powerful dehumidifier and will remove 130 pints of water per day at AHAM test conditions (80°F/60%RH). In the more extreme conditions for which this dehumidifier is designed it can draw more moisture from the air, up to 200 pints per day (90°F/90%RH). With this capacity the LGR 2800i is ideal for larger scale projects. All dehumidifiers have a temperature range within which they are effective and that of the Dri Eaz LGR2800i is truly impressive. When in "automatic mode" this unit will continue to remove moisture in high temperatures of up to 125°F. At the other end of the scale this versatile unit will continue to operate effectively in low temperatures down to 33°F. Low temperature operation is achieved by use of a hot gas bypass defrost system and allows operation down to the minimum achievable by a refrigerant dehumidifier. The high temperature operation, however, exceeds that of most competing units by around 25 - 30 degrees. The LGR2800i provides superior performance thanks to its Low Grain Refrigerant (LGR) technology. This refers to its ability to remove a larger amount of the absolute quantity of moisture in the air, expressed as grains (of water) per pound (of air), than conventional refrigerant dehumidifiers. This is different from simply lowering relative humidity and is important where extreme dryness is required. This is achieved by pre-cooling the air drawn into the dehumidifier in order to extract more moisture through condensation on the coils. In addition to being more effective this technique makes the dehumidifier more energy efficient, with a draw of only 8amps, and so less costly to operate. This has contributed to this unit achieving Energy Star™ qualification. A further energy saving feature of the Dri Eaz LGR2800i is its automatic humidistat which controls operation of the unit to ensure that it only operates while relative humidity exceeds a pre-set level. The LGR2800i is fully equipped for continuous drainage and boasts an integral condensate pump which enables the condensate to be pumped to a convenient outlet and provides approximately 20 feet of vertical lift. The unit comes with 40 feet of drain hose for disposal of the condensate. This unit is extremely durable being soundly engineered and enclosed in a roto-moulded polyethylene housing which is so tough that Dri Eaz provide a life-time warranty for this component. Other warranty arrangements include six years for condenser and coils and one year parts and labor. The Dri Eaz LGR2800i is compact for a unit of its power, with exterior dimensions of 24 x 23 x 40.5 inches. Fitted with an integral handle and robust, semi-pneumatic wheels the unit can be manoeuvred easily on site and is portable being easily transported to its next work-place in a modestly sized vehicle. The unit's air-flow is automatically regulated to ensure optimum performance to suit the conditions and the dehumidifier is equipped with a 3M high air-flow air filter to protect the components and prolong the units working life. As impressive as its raw performance are the refinements which enable the operator to manage the unit to maximise both effectiveness and efficiency. The Dri Eaz LGR2800i incorporates a thermohygrometer which continuously monitors and displays inlet and outlet conditions on the unit's easy-to-read digital control panel. The ready access to this information allows the operator to better manage the unit and job-site progress. As an accessory Dri Eaz offers the "HygroTrac Remote Monitoring System" which allows real-time monitoring of the job conditions and the unit's performance via the internet. A HygroTrac gateway is placed at the job-site and transmits data from the site to the Hygrotrac website. By logging into this secure site the operator can access a variety of information about the unit and the job-site including system information and relative humidity and grain depression readings. This allows the operator to check progress, confirm the location and status of the unit(s) and to make more timely and better informed decisions about the allocation of equipment and personnel. Optional "HygroTrac Remote Monitoring System"